How many people does it take to make a crowd? The buzzword ‘crowdsourcing’ is beginning to make itself heard in archives circles. Yesterday (via @tondelooijer on Twitter) I came across this Dutch partnership project to index militia records [the website’s in Dutch, but you can still spot the word ‘crowdsourcing’! ]; the Archivist of the United States has traced crowdsourcing back to Aristotle; and the ArchivesNext Best Archives on the Web Awards have introduced a new category for ‘Best use of crowdsourcing for description’. What do we really mean by ‘crowd’-sourcing, and can we legitimatally claim any examples in the archives world? 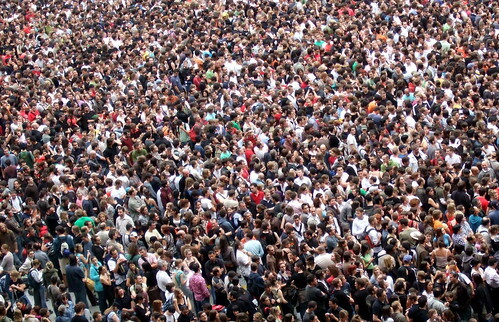 Your Archives has nearly 29000 registered users (as of 1 May 2010) – is this a crowd? It’s certainly a lot of people – or at least it sounds like it is until you consider the quarter of a million individuals involved with Galaxy Zoo. Compare the Galaxy Zoo task to the knowledge required to contribute to Your Archives, or even to add a substantive comment or tag an image in Flickr Commons. Don’t get me wrong, I don’t want to knock the archives examples – I think they’re great (I particularly wish we could get going on a UK version of the Dutch project). But I just wonder whether they can truly be described as ‘crowdsourcing’. Or whether the archives examples merely represent a slight extending of the definition of ‘expert’. Conceding perhaps that the professional archivist is not the fount of all authoritative knowledge, but nevertheless adopting a fashionable term to describe a technology-facilitated adaptation of informal knowledge sharing between archivist and historian. Of all the projects in the archives domain, the one that actually seems closest to my picture of the crowd is Ancestry’s World Archives Project – fairly trivial pattern-matching short tasks, with the answers from several contributors computationally cross-matched. how nice to see our initiative is being noticed! I would be very happy to tell you all about it, but as we are only at the start of our project, there isn’t yet much to say. Our dream is to scan all 19th century militia records in the Netherlands. All Dutch ancestors can be found in these records and we expect a ‘crowd’ to be interested in indexing the records. At this moment we are trying to enthuse enough collegues with militia records to join in the project. We hope to be able to scan 1 million pages this autumn and start indexing next year. When all goes well, I will keep you informed.